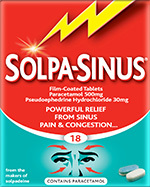 Solpa-Sinus, uses a dual ingredient formulation to help relieve nasal congestion when combined with fever, pain, sore throat, sinus pain and headache in the common cold or flu. Symptomatic relief of nasal congestion when combined with fever and/or pain such as, sore throat, sinus pain or headache in the common cold or influenza. Give 1 tablet every 4-6 hours as needed. Do not give more than 3 tablets in 24 hours. Do not take for more than 5 days.